What can you say about a day that began with the Muslim call to prayer echoing through the streets and ended with an exuberant Catholic liturgy celebrating the Resurrection? That marked Saturday, my first full day in Amman, Jordan. To call it memorable would be an understatement; this was a day that I will not, cannot forget — and it is for days like this that I wanted to make this particular trip. I’m here, really, by chance. I was invited to represent CNEWA as part of a group of a dozen other bloggers and journalists to take part in a tour sponsored by the Jordan Tourism Board. In addition to visiting some famous sites — the Dead Sea, Bethany, Petra — we would be in this corner of the Holy Land during one of the most sacred times of the year, as Catholics and Orthodox here together celebrate Easter (according to the Julian calendar). 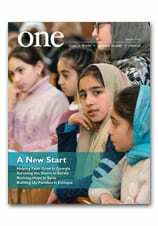 Later in the week, I’ll get a firsthand look at some of the projects CNEWA has been supporting over the years — notably at the Italian Hospital in Amman — and get to meet some of the people we’ve writing about in ONE magazine and on this blog. The opportunity was impossible to resist. So… after arriving Friday afternoon and settling in, I awoke early to the unfamiliar but haunting sound of the Muslim call to prayer. I rolled over and looked at my cell phone. It was a little after 4 in the morning. I had slept fitfully anyway — a 10-hour flight and seven-hour time difference will do that to you — so I decided to get up and, answering the call, pray Morning Prayer. I clicked on my breviary on my iPad and began my day. Our group spent most of this first day on a bus, driving two hours north of Amman to visit the ancient city of Umm Qais, overlooking the borders of Syria and Israel. The day was cold and rainy; we couldn’t see far (though we were told, on a clear day, you could actually spot the Sea of Galilee many miles to the north). Umm Qais was also known at one time as Gadara, and it is believed by some scholars to be the region where Jesus, in Matthew’s gospel, drove demons from a man and into a herd of swine. The cold steady rain had a very different effect on our group, though. It drove us from the open air and into the bus. Unquestionably, the highlight of the day came in the evening, when we experienced two Easter Vigils, from two very different Catholic traditions. Every note was familiar to me. I knew it by heart. But I had never heard this before: The deacon was chanting the proclamation in Arabic. This moved me in a way I hadn’t expected; here was the universal church, our faith, unfolding before me. What I had sung in a parish in Queens was now being sung in this parish in Amman — and in countless other churches large and small, in languages ancient and new, throughout the world. I found myself blinking back tears. To be a part of this moment was an extraordinary gift. After a little while into the Mass, we had to leave to head to another vigil, this one Sts. Peter and St. Paul, a Melkite Greek Catholic Church a short drive away. This was only my second experience of an Eastern liturgy; it included copious amounts of sprinkling, singing, processing, chanting and incense. I walked into the Melkite Greek Catholic church in downtown Amman, Jordan, graciously invited by others. The Sts. Peter and Paul Church was small, with probably 150 people already gathered. We were late. The service was led by the Rev. Nabil Haddad, a gracious man who is working at bridging the gap in the Muslim, Jewish, and Christian world as the leader of the Jordanian Interfaith Coexistence Research Center. I resisted the urge to find a way to make my way outside. I was so out of my element. This was a different culture, a different faith expression in a Middle Eastern tradition. And the service was in Arabic. To an outsider it was nonsense. Chants. Singing. Repetition. Kneeling. There was no music except for the melodic, hypnotic voices of chants that seemed to bring in a mix of Gregorian, Semitic and Arabic influence. I irreverently imagined a Jew in a vestment singing from a minaret. It was disruptive and disquieting. But as the service continued, it was powerful. Across the Middle East, the birthplace of Christianity, believers are becoming a smaller and smaller slice of the population, losing the baby war. And they are oppressed and tormented and killed in some places. Yet, they survive and even thrive because of their love for each other and for God. After the liturgy, we had a chance to spend time with Father Haddad and some of his flock. He’s a longtime friend of CNEWA, and was delighted to meet someone from the agency. He promised to get in touch the next time he visits New York. I rode back to our hotel weary but grateful — and stirred by so many emotions. Several days back, overwhelmed with a thousand details demanding my attention — getting through the Triduum, finishing our taxes, ironing out all the details for this particular trip — I told my friend and editor Elizabeth Scalia that maybe I should back out of the Jordan trip. It was getting to be too much. After my experience Saturday night, I realize: She was right. A parishioner lights votive candles at a Sunday morning liturgy at the Cathedral of St. James in the Armenian Quarter in the Old City of Jerusalem. This Sunday, Pope Francis and Armenian Catholic Patriarch Nerses Bedros XIX will concelebrate a liturgy commemorating the massacre of Armenians by the Turkish Ottoman Empire in the World War I era. For more about Jerusalem’s Armenian community, read about how ‘Living Here Is Complicated’, in ONE’s Winter 2014 issue. Basima Toma teaches English to about 40 children at the Don Bosco youth center. In this image from August, a woman in Germany cries over the loss of her daughter during a protest of ethnic Yazidis against the persecution of their people by ISIS in Iraq. In this image from March, a priest gives Communion to Ukrainian soldiers in Yavoriv, Ukraine.